So it’s Monday…and what a Monday it has been. Between waking up 7 times through the night for no apparent reason, spilling my coffee…twice and then arriving at the shop to be a witness to our computer monitor’s demise…all before 9:30 a.m., it’s safe to say, yours truly was not impressed and certain phrases were being thought….and uttered. The only saving grace of my Manic Monday was my hair. Thanks to Joico and their FAB! Texture Boost, at least I was having a good hair day. 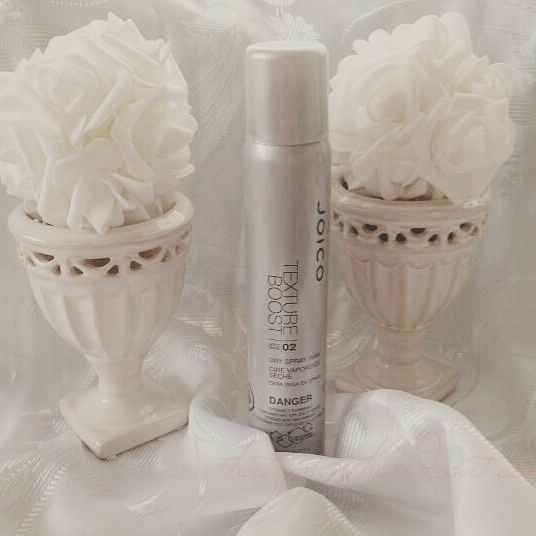 This gem from Joico is a Dry Wax Spray. Yep, you read that correctly, a Dry Wax Spray. Joico Texture Boost delivers the pliability and texture of a wax without the sticky residue – in your hair and on your hands. With it’s ultra fine finishing mist (that smells wonderful), you can achieve movable texture with a flexible clean touchable hold. Joico Texture Boost is a styling agent that can be used on all hair types, from fine to thick, straight to curly. *It’s an awesome styling tool for achieving that tousled, beachy wave for curls. As you all know, yours truly has fine hair. This product did not weigh down my hair at all. I also live in South Western Ontario and the Humidex is at an all time high this week, and in my experience all waxes made my ‘do become a sticky matted mess or my textured tresses gave up the battle against the humidity and I looked like I hadn’t styled my hair at all…until Joico’s Texture Boost. For best results, use on dry hair.